Got my Ood Sigma and Supreme Dalek figurines today and I have to say eaglemoss have done really well with the paint jobs this time. Both figures are expertly painted. Everything ok,not a bad paint job. Got mine today both are fine. Paint job on my supreme is a wee bit drab it could have been a bit shinier to be honest, but I’m ok with it and at least it’s in one piece. Still haven’t got mine!!!! not happy got to wait till Monday ARGH!!!!! This and Ood Sigma have just arrived. If you remember last time round they were in shops days before we got ours. Just received my Supreme Dalek and Ood Sigma. My Dalek has a bent eye stalk, not a happy bunny. Really looking forward to this. Our second dalek in the collection! lol I sent that comment at the time of the doctor’s death. I’ve just had payment taken today!!! pwilc1967, The Dalek Emperor or Issues 12 and 13? I’ve had my payment taken too so should know by next week if we’re getting the emperor. Booboo, is the supreme dalek slightly taller than the bronze dalek we got in issue 6? because I’ve alyways thought the Crucible Supreme was pretty tall. It is a wee bit taller yes. Is the supreme dalek figurine slightly taller than the bronze dalek we recieved in issue 6? Cos i’ve always thought the crucible supreme was tall. booboo, what dalek do we get next? Depends what you mean. The next one in the collection is the Supreme Dalek you can see here. After this the next Dalek is in issue 19 which is one of the original Daleks (from The Daleks). If its the premium subscription one then I have no idea, if I had to guess I’d say Dalek Sec but I’m not 100% on it. cheers. i just meant the normal issues. 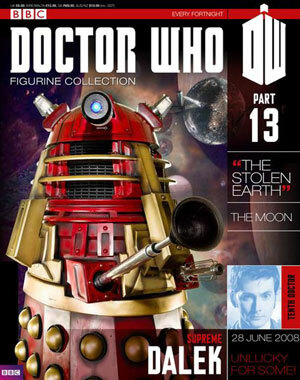 I’m trying to collect older figures that I have missed, so I am thinking to get The Stolen Earth set, because I don’t have any of those figures in it apart from the Tenth Doctor. It is a little pricy, around £35, but it is better value than geting each figure seperataly. Did anyone else notice the Supreme Dalek made an appearance in ‘The Day of the Doctor’ ?. He appears in the Black Archive during one brief moment. Blink and you’ll miss him. Hadn’t spotted him until I watched the episode for a 2nd time. I guess the series 4 Supreme Dalek prop was included to suggest more then one of the same design. Sorry for the 2nd comment if anyone is reading this, the first one I wrote below didn’t show when I wrote this 2nd one. I certainly did! Behind Kate! Yes, I couldn’t believe my eyes. Not noticed yet, oh well I guess I’ll just have to watch it again! Funny how the Supreme Dalek seemed to appear inside the Black Archive in ‘The Day of the Doctor’, blink and you’ll miss it. I guess the appearance of what I assume is the same Supreme Dalek prop might suggest there was more then 1 version of the same Supreme Dalek from series 4’s finale.